It’s supposed to be 100 here, for the next 2 days. Then Wednesday will be in the 90’s, then ‘back down to’ high 80’s by Thursday. Still, weird for this time of the year, even for here in southern California… we don’t usually need our heater before 11/1, but looks like it will be much later this year. This entry was posted in weather and tagged weather on October 23, 2017 by Silver Willow. My skin would melt off of me if it was over 90. Just like that day a few years ago…. I love that meme! 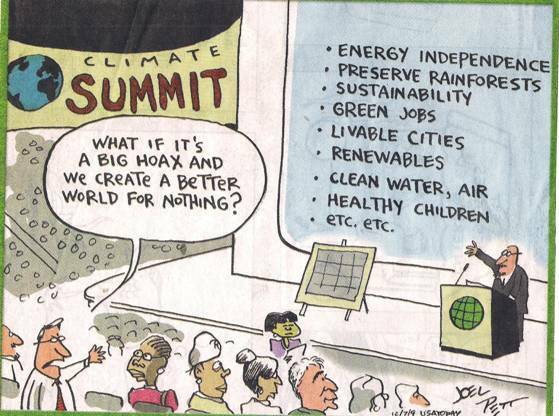 What if we DID build a better world, indeed. My county is having a contaminated water crisis just developing and it kills me that the president is proud that his administration is wiping out environmental protections laws that will cause even more of these kinds of crisis' in the future. Toxic chemicals dumping can take decades to show up in our water and is deadly when it does. At least it's cooling down a bit! I have a love-hate relationship with this weather thing. I love that it has been in the mid-70s here in Michigan at the end of October and winters (at least the past two) lighter than usual. Except I know what that means… and it isn't good. Boy do I hear you. It will be 98 here today in Tucson AZ. We have remodeled an older townhouse this fall and I am so thankful for the air conditioner. The beat goes on here in retirement land. Thank you for reading Retire in Style Blog. I appreciated your comment. Stay tuned. I am 76 and my husband is almost 80. I think you are going to love retirement as much as we have. EEK! At least the humidity is low on the hottest days, though. well, by later in the week….. If you mean global warming, yeah, not good…. Thanks for coming by, Barbara! Looking forward to getting to know you better! My retirement won't be quite normal; hubby is 16 years younger, and works from home 4 days a week. Wow I'm jealous, it's really cold and damp here in the UK. I have a feeling we are in for a long winter. Sigh. But it's a dry heat. Oh, wait, that's over here in Arizona. I predict you're going to spend a lot of time in the pool when you retire in Scottsdale, SW.
Hi Silver, we had our Air conditioners on early today also, but I think we have exactly the same forecast right now. If I could ship them to you, you know that I would!!! We have never got through October without putting the furnace on. I just checked the long range forecast, and I think we'll make it this year. Not sure this says anything positive about the planet though. 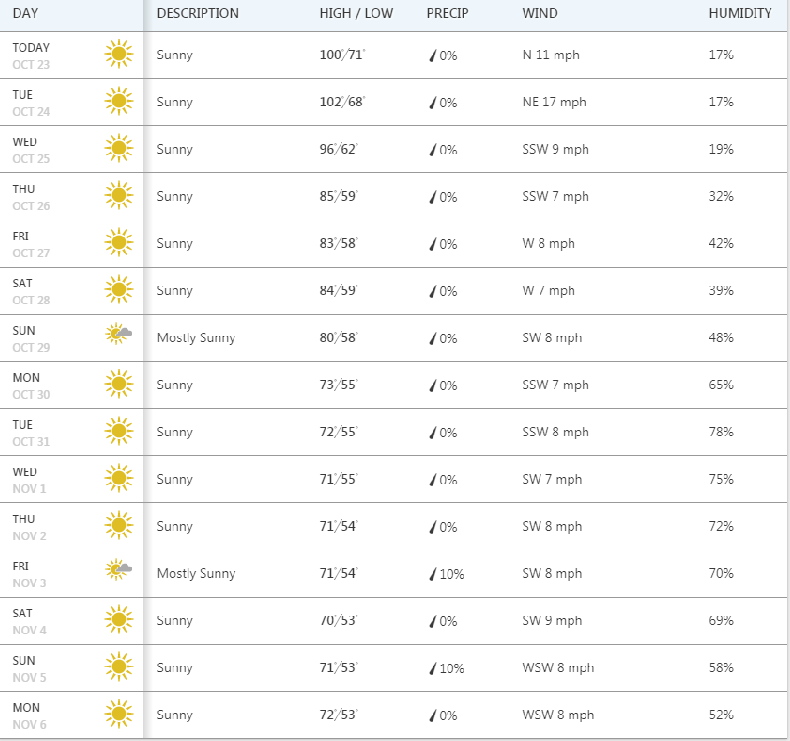 We’re definitely getting those three digit figures here in So Cal — reminds me of when we lived in Phoenix/Scottsdale. We only had a few days like that in summer, but a lot more now and higher (from teens to twenties) there in recent years from reports I’ve read. More humidity there, too, beginning with all the golf courses they were building in early seventies. Expect the areas continued growth contributes. The clear blue skies we so admired when we had vacationed there previos years from Midwest had devolved the first Christmas after we moved there to newspapers first recognition of smog in the area. Don’t know if they’ve been reducing smog since early seventies. How can this nation’s leaders not want to do all we can do to see we have clear clean air in our country? Because if it doesn't line their coffers, it doesn't happen. Smog was because of lead in the gasoline. Remove it, and the worst of the smog disappeared. How long before Trump brings lead back to gasoline for his cronies? Same here……June gloom can drive me to seek higher, clearer ground more times than I care to admit. Suffering with you here in Ventura. Opened the door to leave for work this morning at 5:45 and the air hit like an oven. We are at that awkward stage. Heat on in AM–A/C on in the afternoon. Forty degree change in one day. Amen for climate control via thermostat. It was SO hot here this morning. I felt like I'd already moved to AZ. It was 91 degrees at 7 am. I'm sure we will surpass 100 today!